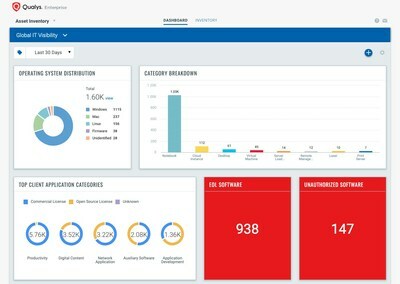 FOSTER CITY, Calif., Feb. 11, 2019 /PRNewswire/ -- Qualys, Inc. (NASDAQ: QLYS), a pioneer and leading provider of cloud-based security and compliance solutions, today announced general availability of its groundbreaking global IT Asset Inventory (AI) Cloud App, which provides Security and IT teams a single source of truth to analyze their complex and interconnected global IT environments, and collaborate on critical security remediation efforts. "Qualys Asset Inventory delivered immediate value by providing insights and exponentially accelerating time-to-decision," said Sunil Saale, Head of Cyber and Information Security, MinterEllison. "It gives us the ability to see every asset on our network, and gives us high-fidelity, granular IT asset data that can be used across IT and security initiatives, such as monitoring for any unapproved software and tracking end-of-life hardware and software that impact our technology roadmaps." "You simply cannot secure what you do not know, and our new groundbreaking global IT Asset Inventory cloud app provides a single source of truth across on-premises infrastructure, endpoints, and clouds," said Philippe Courtot, chairman and CEO, Qualys, Inc. "Since it is fully integrated with the Qualys Cloud Platform, you will know instantly what assets connect to your network, and be able to assess their security and compliance posture in real-time, giving you unprecedented and essential visibiliy."